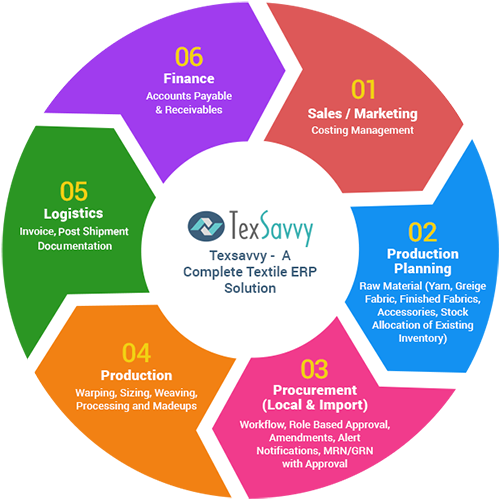 A comprehensive textile ERP suite – Tex-savvy to meet the end to end activities of textile or apparel industries from sales to shipment. Our Texsavvy ERP software will enable to convert all your manual process to digital with complete automation. Our software is a comprehensive one stop solution to cater the textile industry needs from Costing to Order fulfilment including HR related activities like attendance tracking and payroll process specific to Textile industry. AES is one of the leading IT software solutions provider which offers ERP for Home Textile and Apparel industries. Our Texsavvy ERP solution is a web-based platform were the users can able to access the application through a secure Intranet connection across different locations in multiple devices such as Desktop, Mobile, laptops etc with rich look and feel. Our ERP solution coordinates with all the users’ across industry with various modules like Marketing/Sales, Planning, Procurement, Inventory, Production, Logistics and Finance. We aim to provide a user-friendly system that meets your evolving day to day business requirements of industry and seamlessly serves all your customer demands. TexSavvy provides end to end assistance in tracking the status of your Sales Order right from Customer PO to Shipment through Online System. Texsavvy ERP build in such way that it provides data encapsulation according to the module, which ensures the data security across the various ERP module within the company. With our ERP solution experience the smarter way of working and reducing redundant data.